Subaru has taken the knife to its go-anywhere wagon, the Outback, for 2010. With an all-new interior and a similarly reconstructed exterior, the car has a bold face to help fend off the ever-rising tide of crossovers and CUVs. While the redesign won’t float everyone’s boat, it’s certainly memorable and provides more space in just about every direction. 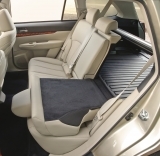 Subaru has also put a keen eye toward making the Outback more comfortable for everyone inside with more headroom, wider seats and extra space for legs in the back seat. While most buyers may shy away from this wagon’s full-time all-wheel drive and boxer engine for fear of fuel economy, the 2010 Outback has proven itself with the EPA – delivering close to 30 mpg when equipped with a CVT. That’s nothing to sneeze at, especially in a vehicle with the Outback’s hauling capacity. A new, multi-link suspension in the rear provides a stable driving platform despite a higher ride height than more low-slung sedans, too. While the available 3.6-liter six-cylinder has more than enough power, and all models feel great at highway speeds. Passenger space has been greatly improved, and the CVT returns fantastic numbers at the pump. We wish we could get the upmarket versions with the six-speed manual. We love the fuel economy of the four-cylinder but feel a car of this weight should have a little more power. Also, where is our beloved XT turbocharged model? The Outback, we are convinced, can go almost anywhere, at any time. While the Outback isn’t made for off-roading like a more traditional SUV or crossover, up a hill or through a stream it goes. While the 170 horsepower, H-4 is just adequate – we don’t think a Subaru buyer will ever question the lack of power – we wish there was a little more oomph to ride. That said, the H-6 gives you all the power you’ll need. The Outback has a smooth ride both on and off the pavement, with low wind and road noise and all-wheel drive to take you where you need to go, smoothly. 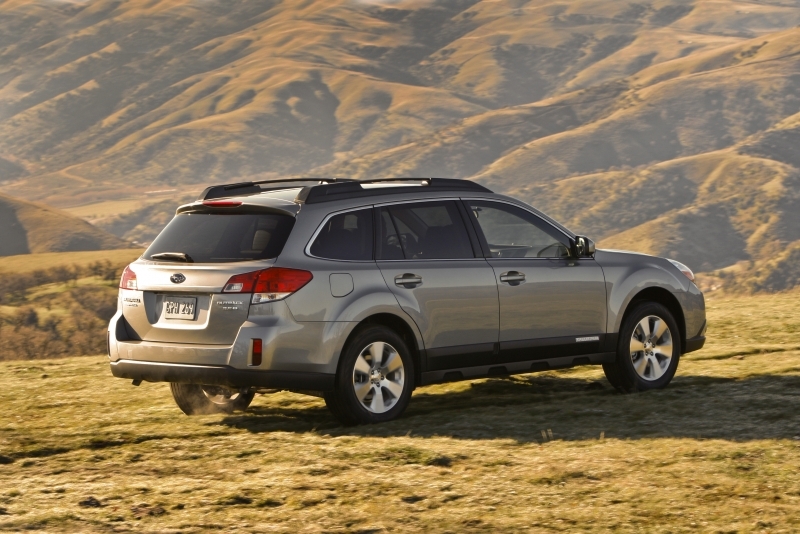 Subaru offers a number of engine and drivetrain options for the Outback. For the eco-savvy out there, the 2.5-liter, flat four-cylinder engine produces 170 horsepower and 170 lb-ft of torque. That engine can be had with either a CVT or a six-speed manual transmission. Buyers looking for a little more gusto can opt for a 3.6-liter, flat six-cylinder engine with 256 horsepower and 247 lb-ft of torque, though that engine is only available with a five-speed automatic transmission. Subaru is known for its quirky, high-torque engines and drivetrains. As with all Subarus, symmetrical all-wheel drive is standard, as is a unique horizontally opposed engine. 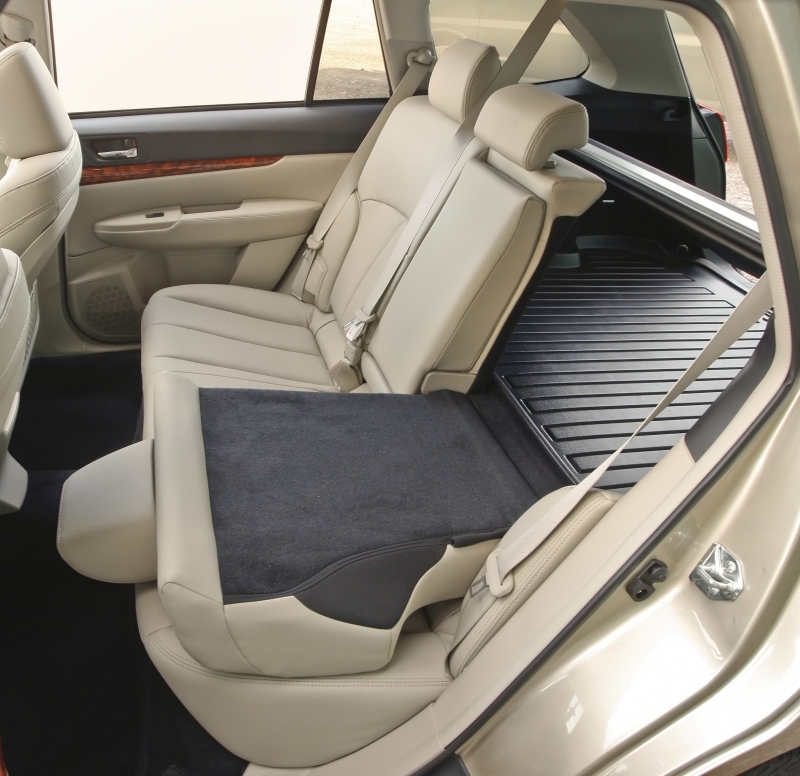 Though cargo room has been squished somewhat compared to last year’s model, the rear seats still boast a 60/40 fold to expand the Outback’s hauling capacity. You can opt for an all-weather package on most trim levels that includes heated seats, side view mirrors and windshield washer nozzles too. Though the 2010 Outback comes with an AM/FM/CD stereo as standard equipment, you can spend a little more coin and opt for a Harman/Kardon nine-speaker system, complete with Bluetooth hands-free calling. Dual-zone climate control and navigation are also available. 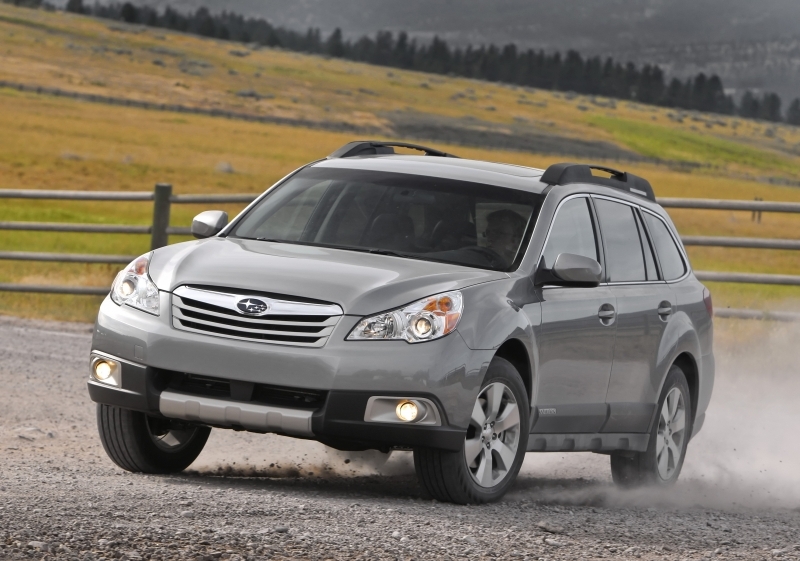 The 2010 Subaru Outback passes the green test with flying colors. When equipped with the 2.5-liter four-cylinder engine and the optional CVT, this all-wheel drive wagon delivers 22 mpg city and 29 mpg highway. Those numbers slip a bit when equipped with a six-speed manual transmission – down to 19 mpg city and 27 mpg highway. The more robust 3.6-liter six-cylinder engine serves up 18 mpg city and 25 mpg highway. Though the Outback’s interior has grown considerably, so has the presence of hard plastics. We would have gone a different route with material choices inside, especially on the center stack and console. Taller, wider and with more pronounced fender flares, the 2010 Outback isn’t going to strike anyone as blatantly attractive. With wrapped headlights and a lunging stance, the exterior does differentiate the brand from the rest of family cruisers out there, and that’s no bad thing. 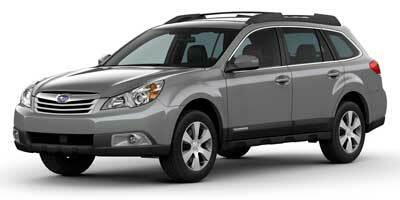 The four-cylinder 2010 Outback starts at $22,995, though the six-cylinder variant will set you back closer to $27,995. That puts Subaru’s wagon on the same playing field as the Toyota Venza at $25,795, the Ford Explorer at $29,010 and the yet-to-be-priced Honda Crosstour. If you’re thinking none of those exactly line up with the all-wheel drive, low-buck Outback wagon, you’re right. The truth is, there aren’t too many direct competitors that offer Subaru’s combination of go-anywhere ability and low MSRP. While Subaru has moved the Outback that much closer to the compact ute/crossover scene by mainstreaming its size and giving it a bold new look, long-term fans may be put off by the changes. The flip side of that coin is that anyone who thought the Subarus of old were a little too odd for their tastes may find something to love in the company’s new wagon. We like that the Outback is the grandfather of all lifted wagons and drives as such. 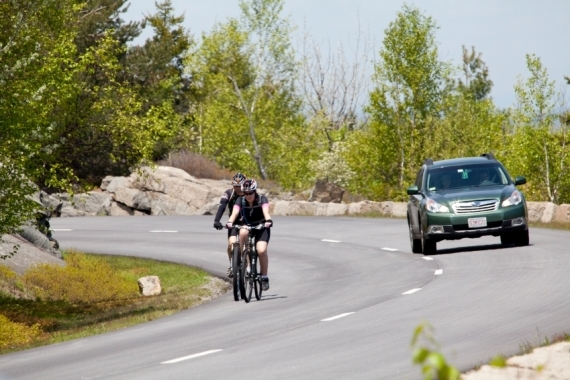 The Outback gives you a drive without pretense, just the way we, and so many buyers, like it.